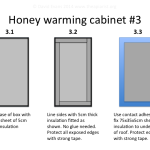 I have previously described an easy-to-build honey warming cabinet. Having reviewed the links that bring visitors to these pages it’s clear that many are Google searches for honey warming cabinet plans. Despite the original pages having a reasonable straightforward description I’ve put together a set of plans and basic building instructions. If you intend to use the cabinet to pre-warm supers prior to extraction then the box needs to be a suitable size to stack two supers side-by-side. I use National hives and the plans describe a cabinet that is of a suitable size for these. The plans and the illustrations on the original pages describing the honey warming cabinet are pretty-much self-explanatory. If you get a local wood merchant to cut the ply to the correct sizes the only tools needed are a screwdriver and a drill. All joints should be glued and screwed. Once constructed the cabinet is very strong. I’ve stacked 18 full supers on mine and regularly stand on the top when stacking things on the shelves behind it. Most of the 5cm thick insulation (Jablight, Kingspan etc.) can be cut easily with a sharp long-bladed knife. However, most of these types of insulation are easily damaged so cover all the exposed edges with strong self-adhesive duck tape (or similar). If you intend to add a small mains powered fan to improve heat circulation you will need to add another hole for the wiring. With the fan installed and a thermostatically controlled Ecostat heater element temperature control is extremely good. 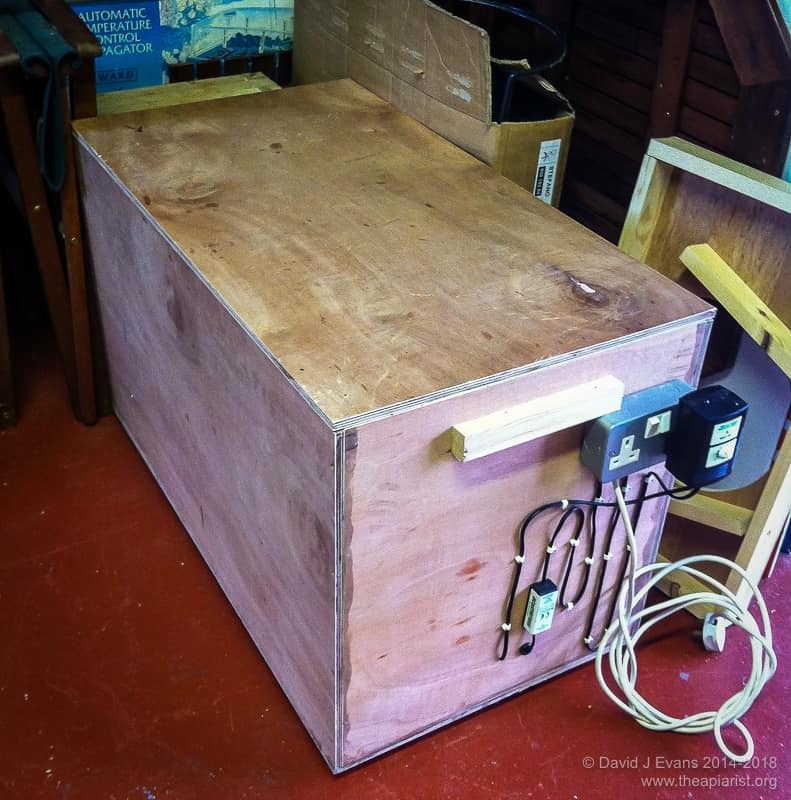 This entry was posted in Beekeeping, DIY, Honey and tagged DIY, extracting, extraction, honey, queen rearing on December 3, 2014 by David.